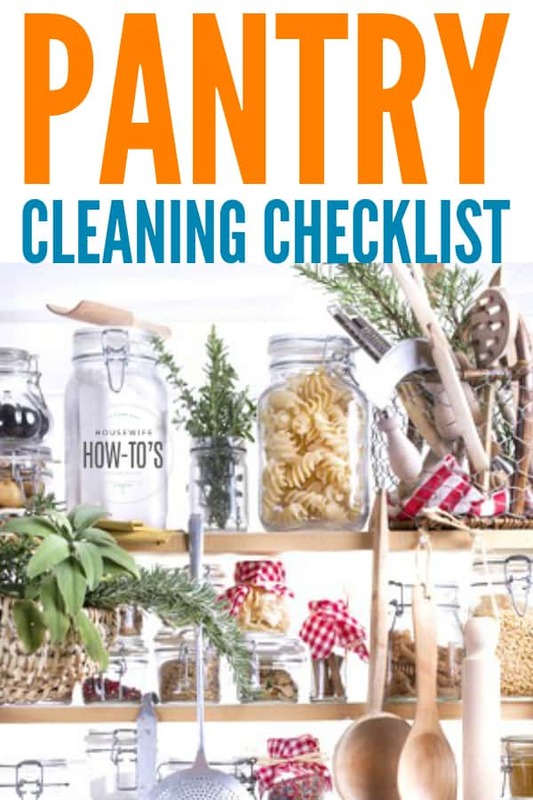 Use this pantry cleaning checklist to get your pantry clean, organized and more efficient than ever before. You’ll know what you have on hand, where it is, and what you need. Plus, you’ll protect your food from pests and keep it from getting stale. Move the trash can close to your pantry shelves and begin removing items, starting at the top. Figure out what’s spoiled by understanding expiration dates, then toss expired and stale foods, including old spices that have lost their flavor. Make a note of items you need to replace. 2. Give away good (unwanted) stuff. If you have canned goods, you know your family will never eat (like the lima beans that sat on my shelves for six months), put them in a bag and give to your local food pantry. So many families are in need! As you work, separate items you often use (cereal, crackers, etc.) from those used less frequently (pickling spices, Christmas-colored sprinkles, etc.). Carefully scrape up any sticky spills with a table knife or spoon. Sprinkle on baking soda to absorb the mess, then wipe clean with a microfiber cloth and warm, soapy water. Let dry, then sweep off or vacuum away any crumbs. Be sure to look in the corners and under shelves for cobwebs. 5. Line the shelves (optional). I am not a fan of adhesive shelf paper because it peels up in the corners and attracts dirt. Those removable rubber shelf liners are pretty amazing, though. They protect your shelves as well as your containers and are easy to wash in the sink. Gather small items like packets of oatmeal or dressing mix and store them in a container. I repurpose empty cereal boxes for this by cutting them in half and covering them with brown craft paper then attaching a pretty chalkboard-style label. 7. Repackage dry goods to protect them. Ants, cockroaches, and pantry moths can all get into cardboard boxes or paper bags. 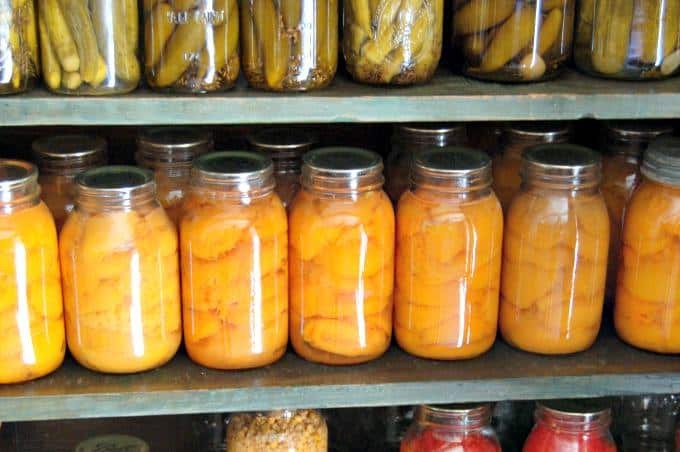 To preserve your dry goods, transfer them from their original packaging to air-tight glass canisters that let you see what’s inside. Worried you won’t be able to tell all-purpose flour from cake flour? Label them! Keep your baking items (flour, baking soda, etc.) with each other so you can find recipe ingredients quickly. Store multiples together, so you know how many cans or boxes of an item you have left. A can rack organizer can drastically increase your storage while keeping things neat. If you have several foods about to expire, place them together in a container, so you know to use them ASAP. Wipe down items as you return them to the shelves. Heavier items should go on the floor or lowest shelf for safety. Place less often used things on the highest shelves, and more commonly used foods at eye-level. If you want your kids to help themselves to snacks, be sure to place them conveniently, so they don’t rummage around. 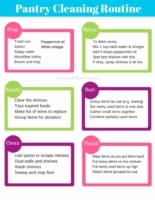 Hang this inside your pantry door or tuck it in your household binder for an easy way to remember all the pantry cleaning checklist steps. Congratulations on your new job, Kaila. I’m glad you’re enjoying the printables! I just found your blog today and I am LOVING all of the printables! However, the flowchart for the pantry doesn’t print correctly. Do you mind making it so that it will? Thanks a bunch!! I also plan on trying the recipes for homemade cleaners that I am super excited to try! I’m just reading over the days and this one is a day I’m NOT looking forward to. I am though looking forward to how my house will look when I’m done. So far the daily cleaning routine is going good, the other day my daughter wanted to make the bed before we got out of it. Alright, your post has really inspired me to clean my pantry (long overdue!) I suspect I’m going to find all sorts of things lurking in the back….We usually have a good suply of canned food just in case we get stuck at home. I hope your husband is recovering well. Best wishes to you and your family. Thank you, Raquel. He’s recovering nicely! I’m due for a pantry-cleaning, too, after our house guests leave. Three weeks with other people going through the cupboards and pantry willy nilly (and not even paying attention to my pretty shelf labels… *sniff*) means it’s a mess. These are some really great ideas. I love my pantry but it can definitely get out of hand. Especially with children rummaging through, right? I can find anything in my pantry, until my son gets in there. Then, whoa Nellie. It looks like a tornado hit it! First off, I hope that your husband is recovering well. That’s more important even than the pantry. Guess after several moves and quite some years I learned some tricks in keeping the pantry neat. Important is to have a sequence where you put the newest items so you don’t end up keeping the old things forever. Grouping by use is great and I do that too. I’ve learned to place flour and also rice in the freezer for avoiding any meal bugs. Works very well. Oh, my husband does that and it drives me nuts! Then again, I do the same thing with stuff in the freezer. I have oodles of “bags of bits”, as he calls them: produce that was days from going bad that I’ve blanched, stashed and forgotten about; rinds from hard cheeses that I decided to save for soups or fondue; heels of bread, etc. Opening my freezer can be a terrifying thing if I haven’t cleaned it lately, because all of my bags of bits come tumbling out like Fibber McGee’s closet!